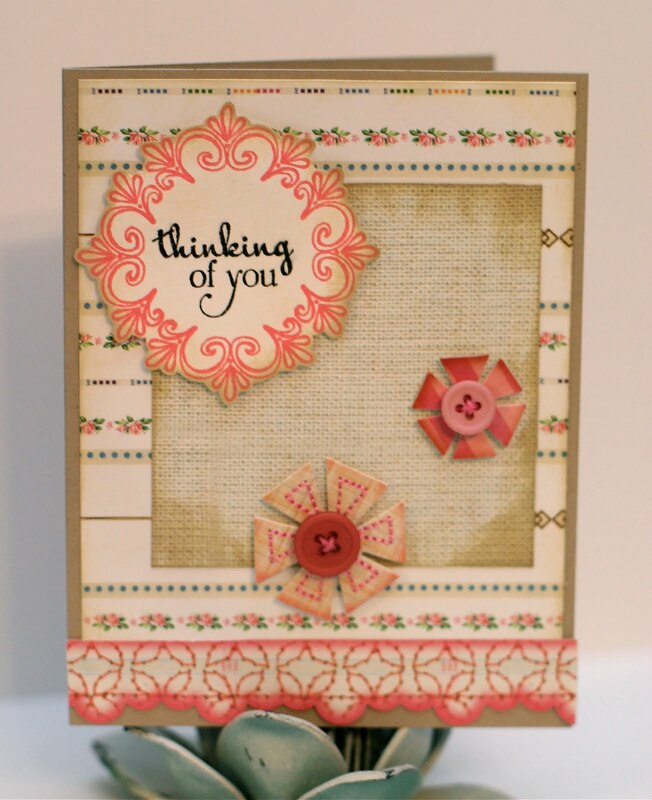 Today I'm happy to share a card I made with Stampin D'amour's French Vintage set that is perfectly suited for a 1.5" circle punch and the color palette from this week's Color Throwdown. 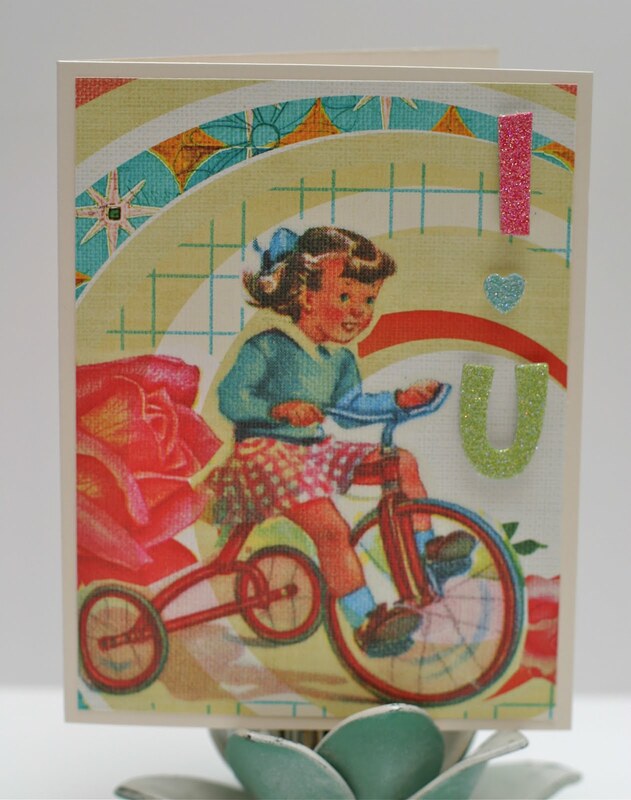 I used my Cuttlebug to cut out a couple of different shapes using Spellbinders craft foil and mounted the stamped image on top, finishing the card with some olive ribbon and a vintage, rhinestone button. 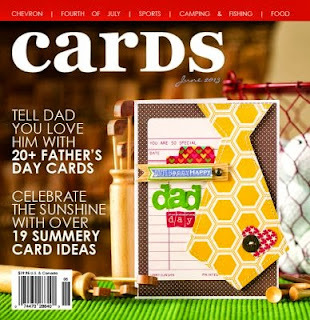 There is a fun little contest going on over on the Waltzingmouse Stamps blog challenging everyone to CASE a card made by one of the design team members as part of the Spellbinders party last weekend! There are prizes to be had and time left to play so head on over! I chose to case this card made by Laurie but had to use Labels 4 because I don't have the same label set that Laurie used (yet...) :). I tried to keep the same palette - pinks and creams with a rose patterned paper in the background. I finished the card with some shabby ribbon topped with a vintage button. I was starting to feel a bit scattered in all of my crafty pursuits so I sat down at the beginning of the year and wrote down the things I really enjoyed doing and started prioritizing them. Playing along with VLV has been on my list for a while and this month I made sure to keep track of the new sketches on Fridays so I wasn't overwhelmed at the end of the month. Easy peasy! I cut the blue heart out of some felt and recycled some satin ribbon for the wee bow. The arrows were stamped off once using Riding Hood Red ink to give it a more subtle red color. Today I'm going to share a pretty easy way to create something special using supplies you probably already have - adorable cupcake toppers! I start by picking out a stamp set that will coordinate well with my circle punches. In this case, I chose to make toppers for some Valentine cupcakes so picked a Valentine/love-themed stamp set. I decided to make my colors a couple different shades of rose. I stamp all of my images first saving the punching and cutting for later. I punch after I stamp because I think it is easier to center the stamp with the punch than try to center a stamp on an already punched shape. Don't forget to punch a coordinating circle to use as the back of the topper. 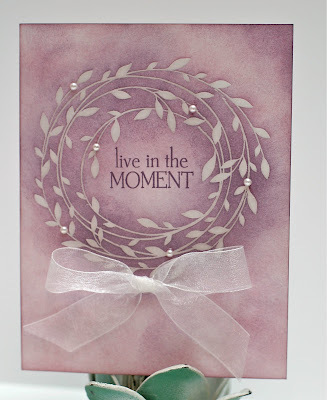 Once all my stamping and punching was finished, I added some Stickles for a bit of shimmer. Center a foam square on the punch that is the backside of the topper and attach a wooden toothpick to the foam. I like to use heavy-duty, round toothpicks for toppers. Attach the front shape to the foam. Finish the toppers with a bit of ribbon and you're all set to "pretty up" some home-made cupcakes! Though I made these for Valentine's Day, I'm sure you all have stamps you can use for any occasion - think birthdays, anniversaries, and showers! Fun and simple! Welcome to Papercraft Star Challenge #30! Can you believe it has been 30 already!! This week is all about inspiration and scraplifting and you have free reign to borrow anything from any of us as long as you link to the original item on your blogs! Fun!! 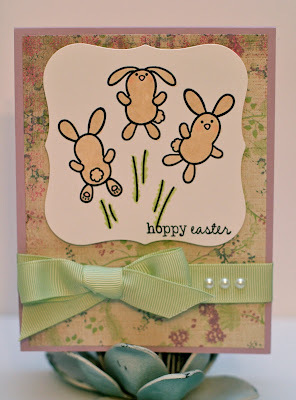 For my project, I used this card of Kim's as my inspiration and a cute bunny image from Pink Cat Studio. I have had so much fun this month with the digis and thank them for generously sponsoring our DT this month!! 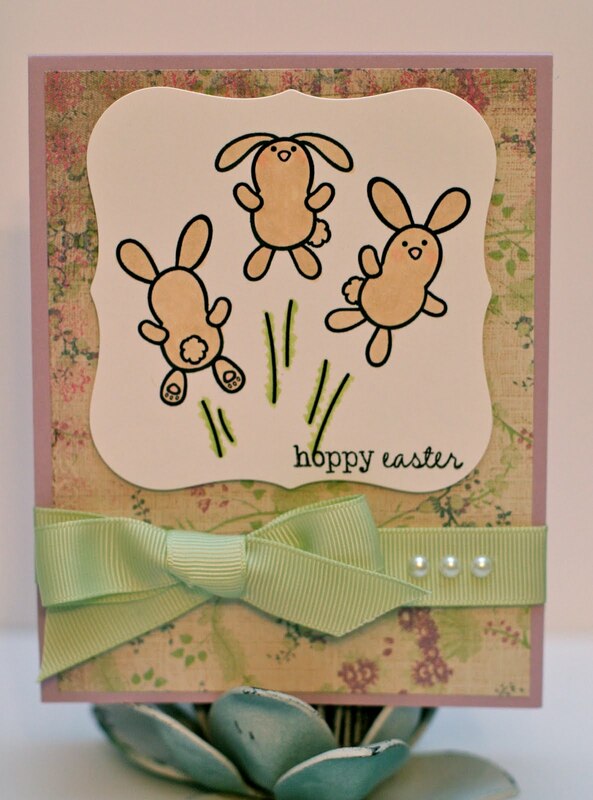 I adored the springy yellows and purples of Kim's card and the brown bunny was too cute to pass up, right down to the blush on his little cheeks! Instead of pearl stickpins, I chose to add three little pearls to the side of the ribbon. 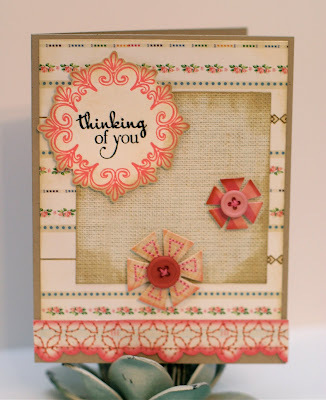 I've been looking forward to this month's Papertrey Ink blog hop for a while now! This month we've been challenged to use a Papertrey stamp set that has yet to see ink or one that may be collecting a little dust. While I'd never say my stamps are dusty, I sure know of a few sets that need some more love! I chose to use my Scattered Showers/Additions sets to make this tag that I think could be used for a bridal or a baby shower or just to wish the showers of blessings it advertises, right? I stamped and cut out the wee boots using a cheery yellow, coordinated the umbrella, and finished the card with a little baker's twine bow. Good morning! I can't believe it is Monday already - we had a gorgeous weekend here in San Francisco and I could have used at least one more day of some r&r! 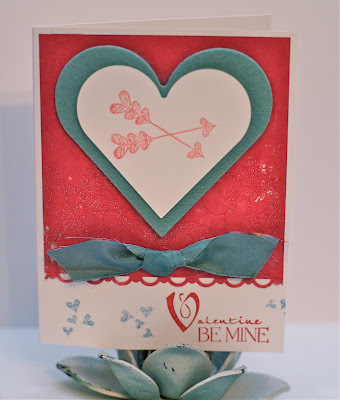 Today I'm sharing a card that I made using the French Vintage set from Stampin' D'amour! I love the sentiment in the set "Dance is the delicate balance between beauty and perfection" and it went so perfectly with this image! 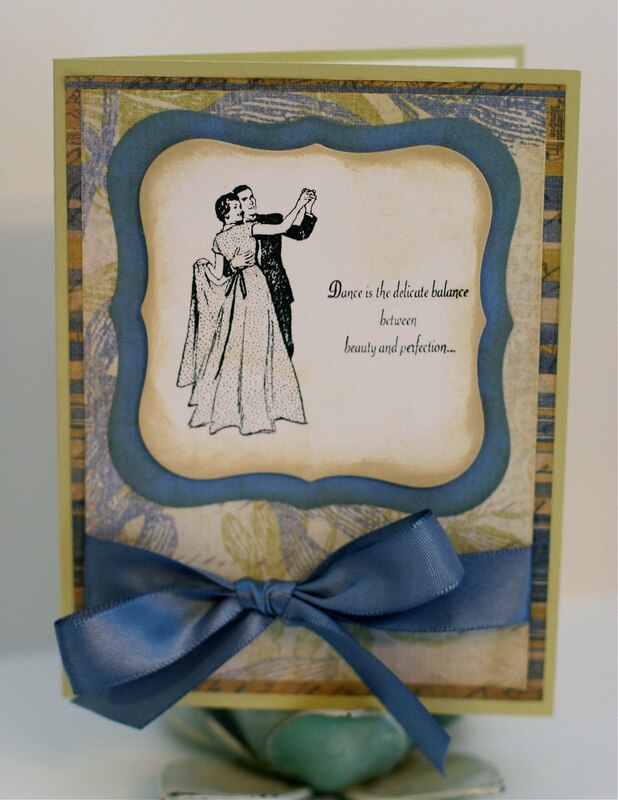 I chose a celery/cornflower color combo and distressed the edges of the papers for more of a vintage look. Here's a card I made for this week's Waltzingmouse Sketch challenge! I love the star image from the sketch and thought it would be cute to use the star stamp from Seasons of Love - Tags as a sort of sheriff badge! I used glittery, copper embossing powder and really like how it pops off of the black card stock! I finished the card with some coordinating chipboard stickers. Today I have a card that I made for a friend and used the Mojo Monday sketch as inspiration! 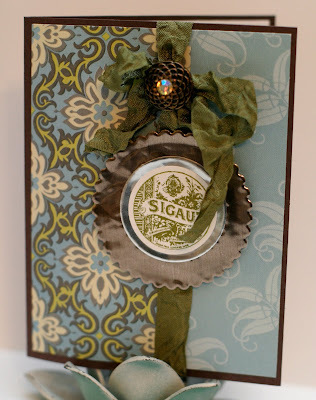 I love the fun papers and embellishments from Sassafras and thought they were the perfect addition to the frame. I fussy cut the frame and distressed the edges of the papers with a bit of ink to take some of the crispness away. I really like how the softer papers work so well with the kraft card base! In keeping with the wedding theme of this week, I'm happy to share this wedding card! Four years ago today, we were winging our way off to Kauai after only getting a couple hours of sleep after our big day! I remember falling asleep in our room that afternoon and waking up to sounds of luau music a couple hours later. Ahhhh, bliss! Today is a special day - it is my 4th wedding anniversary to my very best friend! We call this our anniversary week because we met on January 17th and then married on the 20th (of a different year, of course!) :) I thought this simple card said it best and I feel like such a kid at heart whenever we're together. He makes me laugh, enjoy the simple things, gives me hugs when I look like I need one and just gets me. I love you sweetheart!! 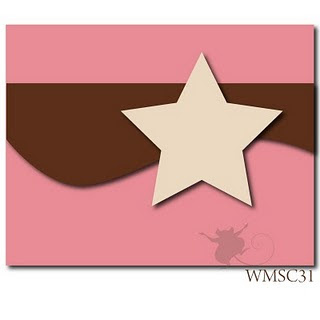 Welcome to Challenge 29 at Papercraft Star!! This week it's all about color and aren't these some doozies?! I hardly ever find myself using bright colors but the great robot digi from Pink Cat Studio made it easier for sure!! 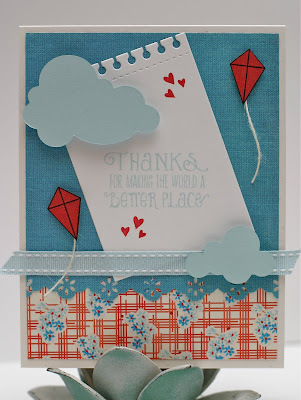 I paired the image with some fun background papers and some turquoise twine. 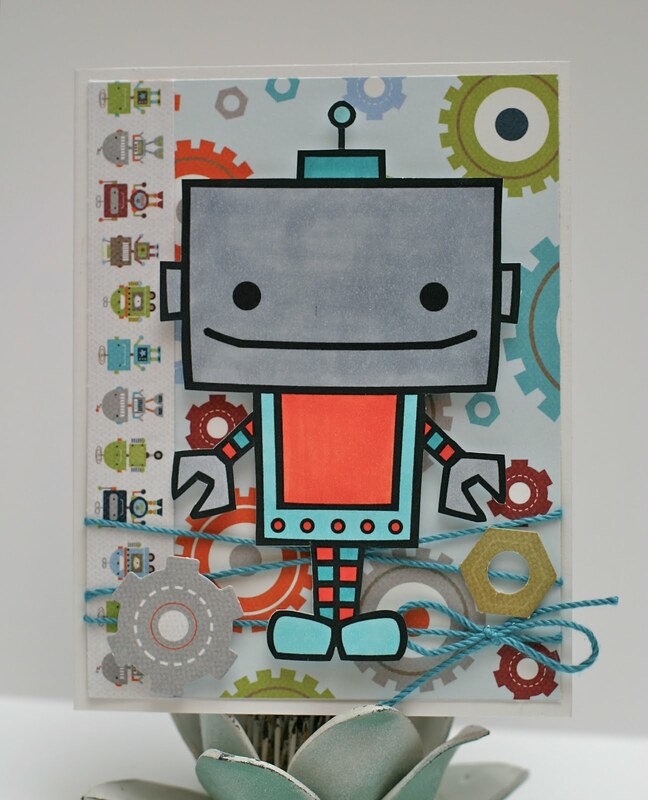 I think the space on the wee robot's chest would be perfect to stamp a number for a kid's birthday card or a heart if you were sending it to a loved one. Very versatile! I'm looking forward to seeing your creations for this week's challenge and don't forget to vote for the winners starting this weekend! Have fun! 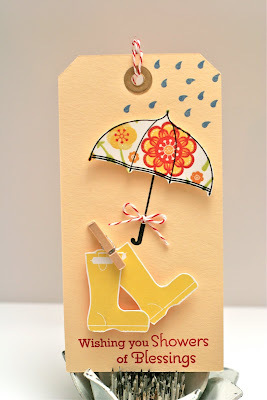 Today I'm sharing a card I made for week 3 of the Viva la Verve challenges - I can't believe I've kept up this well! I really love the way this card came out - the soft blues with the pop of red worked better that I expected they would! 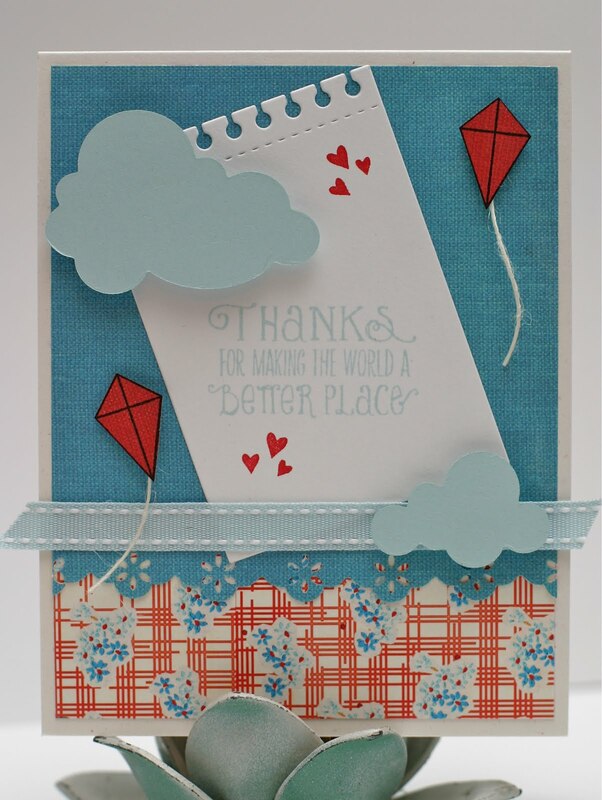 I paired an older set, American Hero, and a new set, To the Moon with some adorable Sassafras papers and some fun clouds and made a card I really love! Today I'm happy to share a fun tag set I created with the new French Vintage set from Stampin' D'Amour! I just love the chic images Pamela created and included in this set! There's a bit of everything from iconic France like the Eiffel Tower and Marie Antoinette to fashionistas and fun sayings like "Bonjour" and "Ooh la la!" 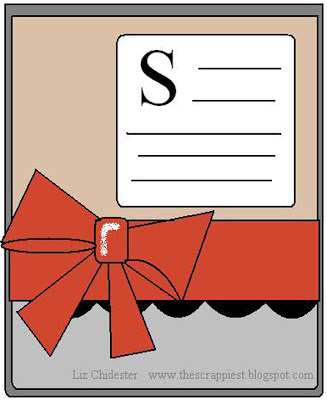 At 2.25 x 3.5, these fun tags are small enough to use as ATCs or as embellishments for scrapbook pages. 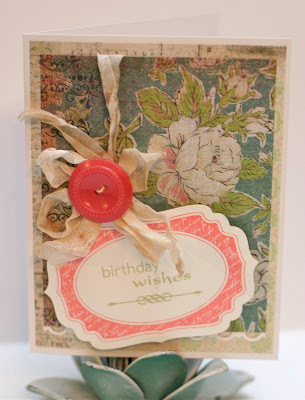 Hello and welcome to another fabby blog waltz featuring those of us who adore Waltzingmouse Stamps! Get it, adore...j'adore...okay, I'll stop. If you just happened by, head on over to the 'Mouse House to get started! The theme of this month's Waltz is Valentine/Love and I have a pretty card to share with you that I made for my hubby for Valentine's Day! I used the Sweethearts set along with some cute American Crafts papers/Thickers, and tried faux stitching for the first time! I really like how it came out against the red hearts so just may have to try it again! I also made my own patterned paper using the cute bow and arrow image from the set! Another fun technique I know I need to try more! I have so many cute stamps that would make great background papers! 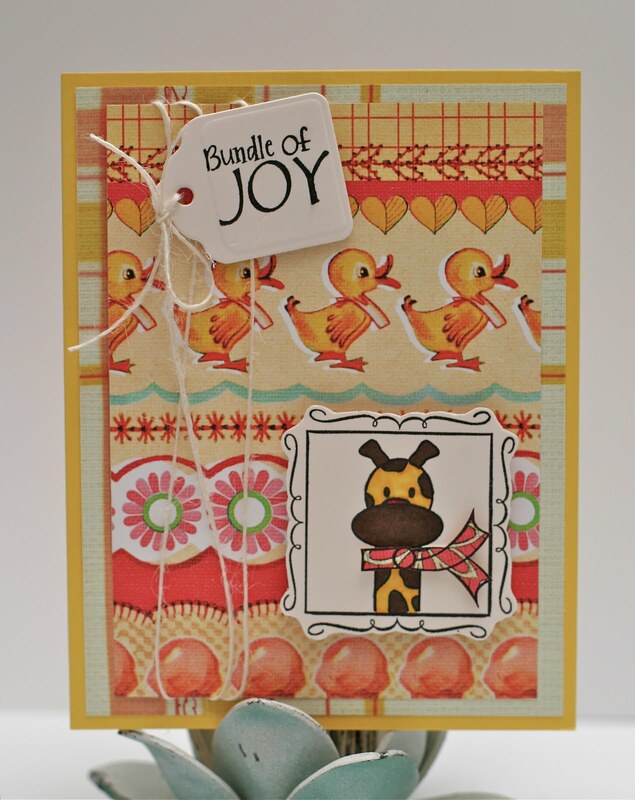 This is a fabby new card I made with some of my favorite Sassafras papers and a brilliant new set of stamps from Verve for the week 2 Viva la Verve and the new Diva Dare Baby Love challenges! I stamped the frame and then put the Copic-colored giraffe inside, fussy cut around it, and added a paper pieced scarf. I finished the card with some twine and a sentiment tag. Here's a card I made for the Mojo Monday challenge. I've been following along with Mojo Monday for a while now but haven't had a chance to play very often. Here's to taking part a bit more in 2011! Here is a card I made for this month's Hero Arts contest. I had a lot of fun on their blog hop this week and was inspired to finally try the emboss resist technique! I love it every time I see it but since I'm not a big sponger, have been dragging my feet. Since I've promised myself to try new things this year, I went for it last night and am pretty happy with the results! I'm happy to share this card with you today that is based on this week's sketch over at Waltzingmouse! 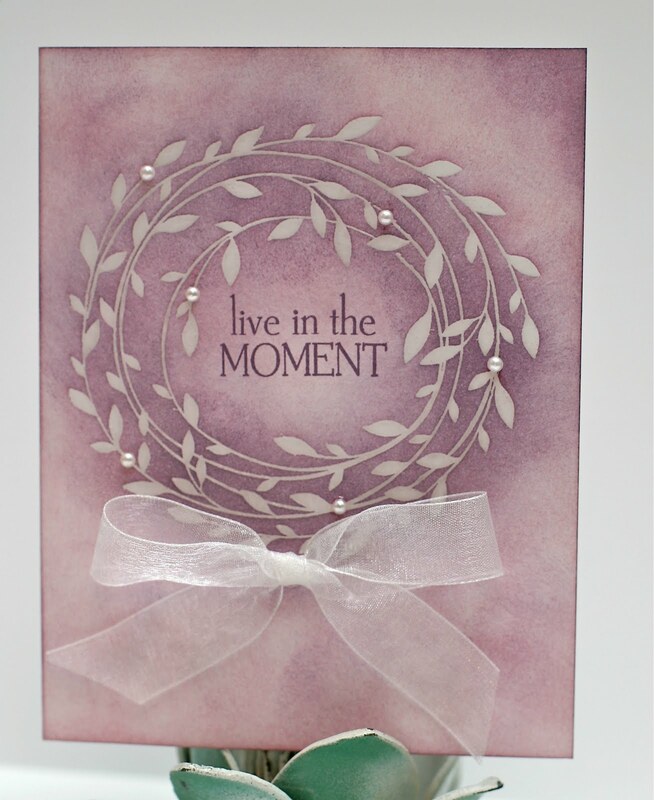 I stamped the card base with Text It, cut labels and stamped the sentiment and finished the card with a sticker strip and some wee pearls. 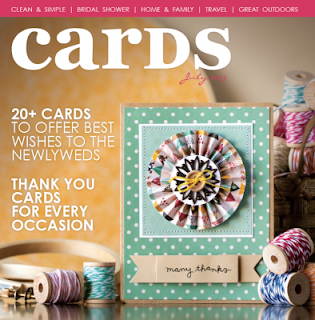 Welcome to another challenge at Papercraft Star! This week we've got a fun sketch and the rest is up to you! I started off with an adorable digi from Pink Cat Studio, searched for some papers, colored the image to match, and finished the card with a big, yellow bow. As I was making the card, I thought it would be perfect for my newest buddy Elliott's first birthday! 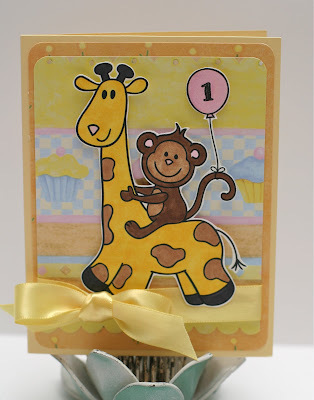 I found a small number stamp set and stamped the balloon with a #1. Too cute! I can't wait to see what you come up with using this sketch!Remember to vote because the winner is up to you!! Have fun!